Ayurveda comprising of Ayur (life) and Veda (Science of Knowledge), is a holistic healing science which is believed to be more than 5000 years old. It was conceived by the rishis or sages over a period of many centuries with the help of observations, experimentation, discussions and meditations. It deals with the complete way of life than just the treatment of diseases. 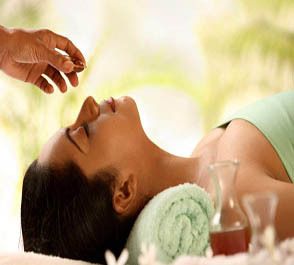 The introduction of Ayurveda courses in Rishikesh is an idea which originated on the basic principles of Ayurveda. The courses provide a foundation to understand essential Ayurvedic concepts and help to provide a requisite base for further studies associated to Ayurveda. The interactive courses reveal the secrets of Ayurveda and present them comprehensively and practically. Further, the courses also introduce you to the Ayurveda theories like Doshas (biological energies), Dhatus (body tissues) and Malas (body wastes). So if you are interested in enrolling in our Ayurveda training course in Rishikesh india then you can contact us at hathayogschoolrishikesh[at]gmail.com. Ayurveda center in Rishikesh will get in touch with you and give you complete details related to your needs and also provides Ayurveda massage in Rishikesh. This ayurveda treatments in Rishikesh emphasizes the importance of plant-based medicines and sometimes animal products and includes a large variety of herbs, oils and herbal pastes that are ingested or applied to the different parts of the body. The Ayurveda training in Rishikesh help to promote a different type of physical healing, emotional well-being or spiritual awakening, based on your needs. It is an application of oil on head and body by massaging it gently on the body. Our trained therapists ensure that the right type of herbal oil is used for this purpose based on your Dosha Prakriti. The therapists apply a variety of Ayurvedic techniques along the energy channels of your body in a synchronized manner so that the vital energy gets restores properly. Imparts softness to the skin. Helps sleep better at night. In this treatment, our experts massage the body with herbal powder in reverse order, beginning down and then moving upwards. The major benefit that you get from such treatment is easy to weight reduction. Toning the body, muscles and bones. 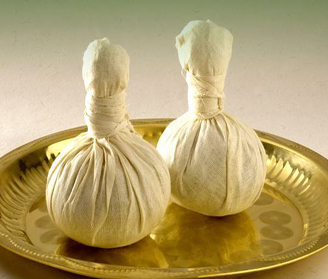 Swedana is an Ayurveda herbal steam treatment usually meant for fat reduction. 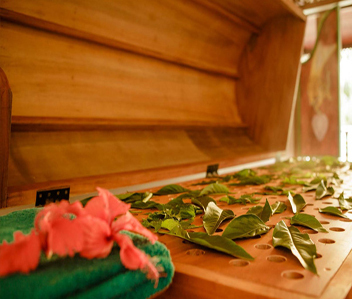 Our experts induce sweat in your body with the help of steam which is generated from medicated herbal decoctions. It is a pre-operative procedure in several Ayurvedic detox therapies and helps to dilate the channels of the body to release and flush toxins from the tissues. Patra potli swedana is a type of Swedana in which our experts induce/generate sweat in your body by applying vatahara leaves in a potli. Both herbal leafs and medicinal powders are used. The affected areas of the body are massaged by using boluses. Reduces joint pain and stiffness. Rejuvenates and strengthens bones, muscles and nerves. Reduces inflammation, traumatic pain and swelling. This treatment is a kind of Swedana but is more effective than another kind of Swedana as it involves three aspects- oleation, sudation and nutrition. In the treatment, our experts use boluses that are filled with Shahtik rice. The rice is cooked with herbal decoction and milk till it becomes a pudding. The experts then apply it externally with heat. Vata disease such as paralysis, joint pain. Sluggishness and improves blood circulation. In this treatment, our experts administer medicines in the body through the nose. There are many kinds of nasayams. Hence, the experts choose the right type of nasayam that suits your need, as the nose is the door to the brain and therefore to consciousness. Reduces premature greying and other hair diseases. Reduces stiffness of the neck and shoulders. 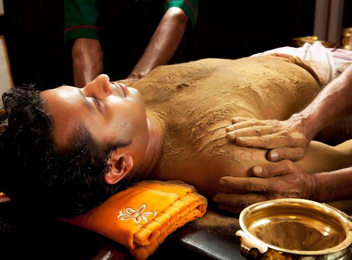 Shiro means head and Abhyangam means Ayurvedic massage. So, as the name suggests, this treatment focuses on areas like head, shoulders and neck. These are the key areas affected by stress the most. 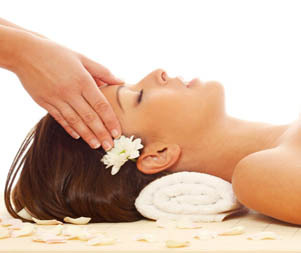 Hence, our experts massage the head and face with medicated oils to reduce pain and stress in these areas. Acts on the central nervous system and reduces aches and tensions. Improves hair texture and gives strength. Improves blood circulation in the head. The word Shiro means head and dharma means flow. So as the name suggests, in this form of therapy, the experts gently pour herbal oils or other liquids over the forehead. This helps to relax the body and mind and has a major advantage for our nervous system. Relieves symptoms of anxiety, stress, hypertension and fatigue. Relieves the mind from tension, headache or depression as well. This is a special oil massage for the back, shoulders and neck. This treatment is a good choice for those who spend a lot of their time in the office and need to relieve their muscles from pain and stiffness. The experts perform this massage in a relaxing horizontal position and apply a special oil to cure your sore back. As the oil is applied, your back feels the warmth that reduces the muscle pain and helps to heal strain and bruises and relax those stiff muscles. Reduces stiffness and relax the stiff muscles. In this treatment, the experts do a special oil massage of the foot, legs and knees, focusing more on the reflex joints. This helps to sooth, revitalise and calm the various disturbances of the autonomic nervous system. Reduces roughness, dryness of the foot. Reduces stiffness in the foot muscles. Reduces tiredness and numbness of the foot and leg. Provides strength, stability in the foot. Now that you know the various types of Ayurveda treatments in Rishikesh, you might now understand that you can witness a great revival in your body and mind with Ayurveda. Many people now worldwide are looking forward to a holistic, sustainable, safe and holistic form of treatment. And, India being the birthplace of Ayurveda has a lot to offer to the people via the treatments to cure several diseases, even those that are labelled as ‘incurable’ by modern science.